The Mother of All Best Practices! Do you know how you measure up to your competitive peers? Benchmarking your Key Performance Indicators is the only real way to know. Without it, you are simply “going with the gut”, which is often wrong and brings disappointment. With benchmarked data, you can conduct analyses and plan initiatives that really work. 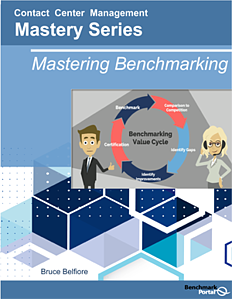 Download our 14 page ebook today to help you understand why Benchmarking is so important to Contact Centers.